The Output Window is a two-tabbed window appearing at the bottom of the E-Studio display window by default. The Generate tab provides feedback to the user concerning the generation of the E-Basic script. 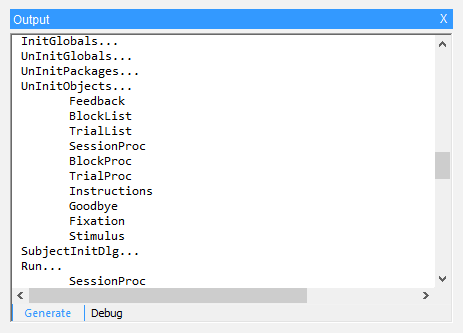 The Debug tab displays any error messages generated during runtime or debugging information generated through the use of the Debug.Print command in an InLine object (See SCRIPTING: Debug  for more information on Debugging). A context menu may be displayed by right-clicking in the Output window. The context menu allows various options such as copying the contents of the Output window, clearing the window of the current contents, or to searching within the output text for a key phrase.